Using pesticide-free, toxin-free, and environmentally friendly products in our treatment process. 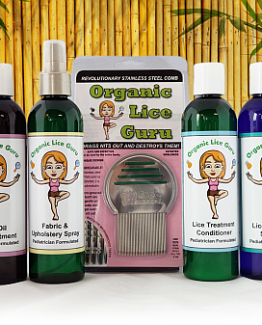 Providing public education on the dangers of pesticide use in common lice removal treatments, resulting in lower pesticide load in our children as well as in our groundwater. Remaining a local business, not a chain, thereby directing income back into other local businesses in our local community. Educating families to stop doing unnecessary vacuuming and laundering in order to get ride of lice, thus saving on water and energy use. Requiring only one visit for a complete treatment, this cuts down on gas/fuel use as compared to nitpicking chains that make you buy a 3 visit package.